I enjoyed all of them, but Single Race ended up being my favorite. 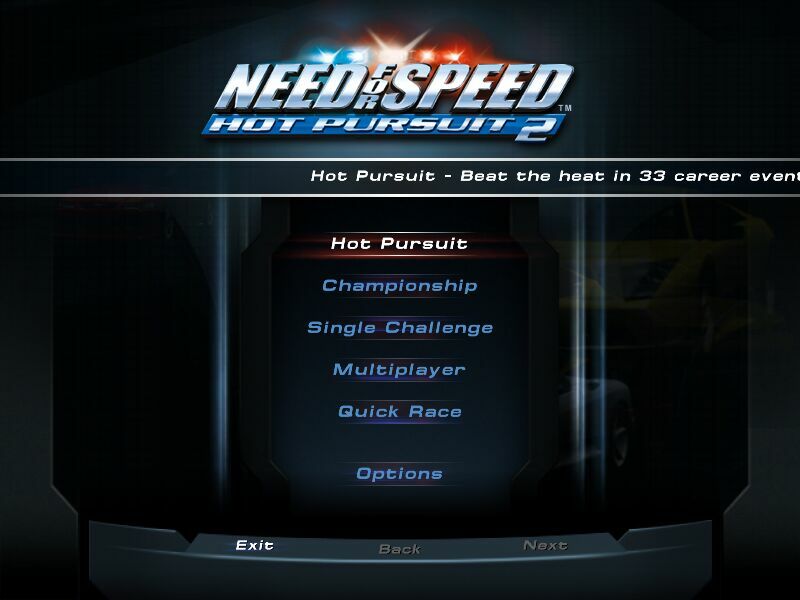 Both Hot Pursuit and Championship are essentially a ladder of different events. By winning each event, you get points and with points, you can buy new cards and tracks. It takes quite a while to complete all of the levels, but that�s mainly because each course is very long. 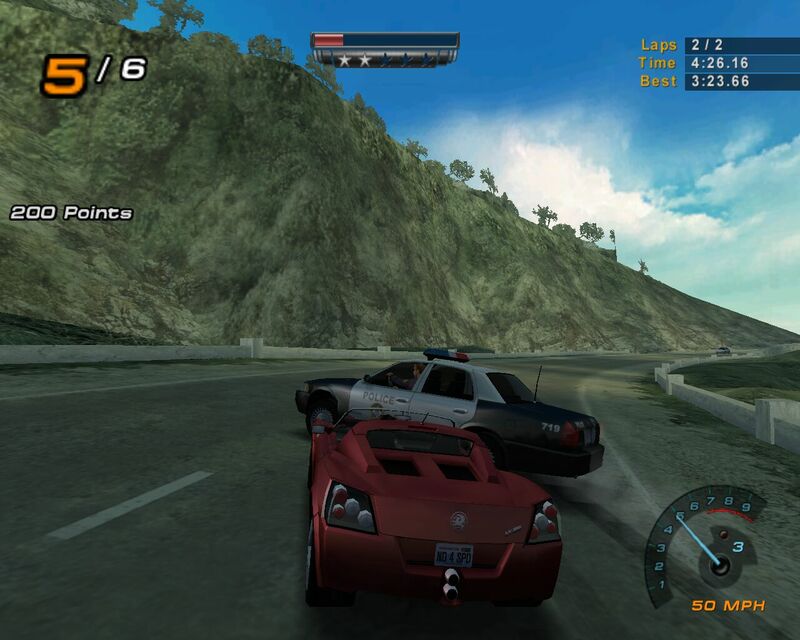 Need For Speed Hot Pursuit 2 also offers a Multiplayer mode. 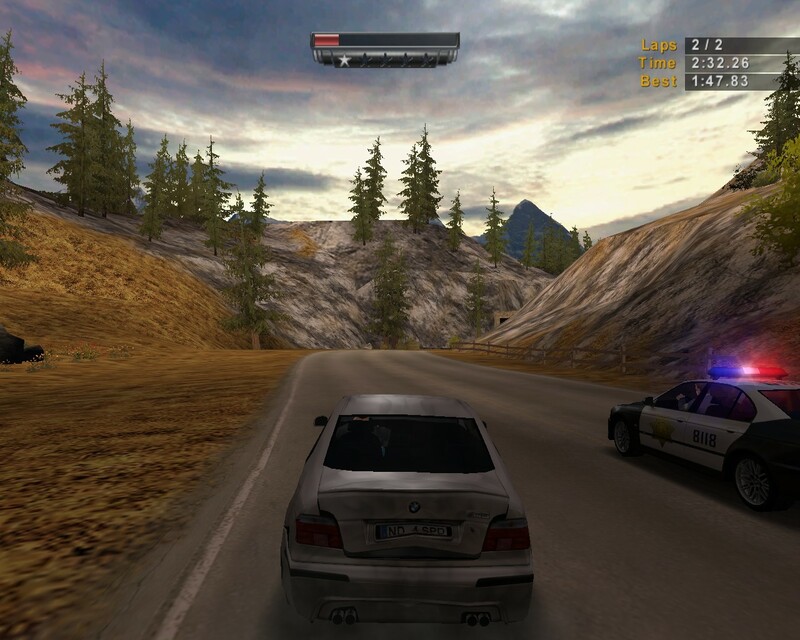 It�s fairly simple, just go to the Multiplayer section and select your server. 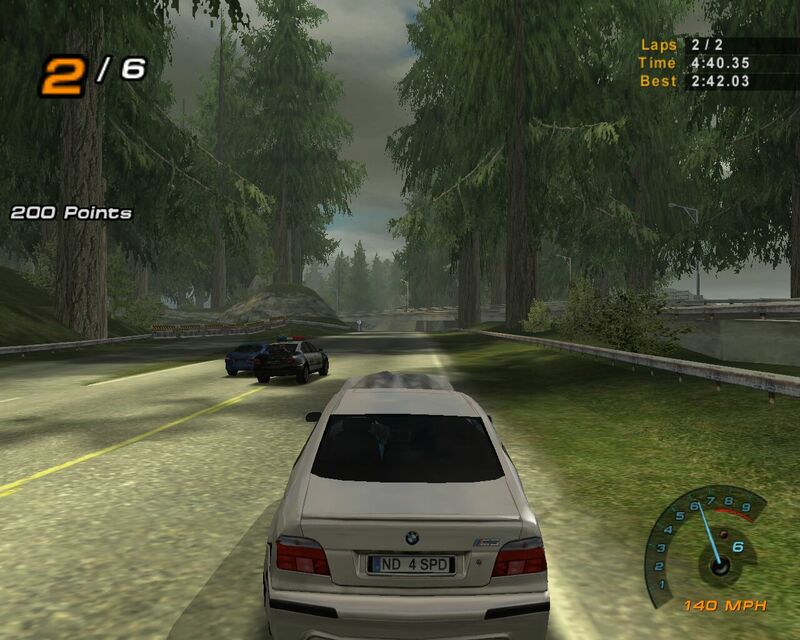 In seconds, you�ll be racing with other people. Rooms were constantly crowded, which is a good thing. 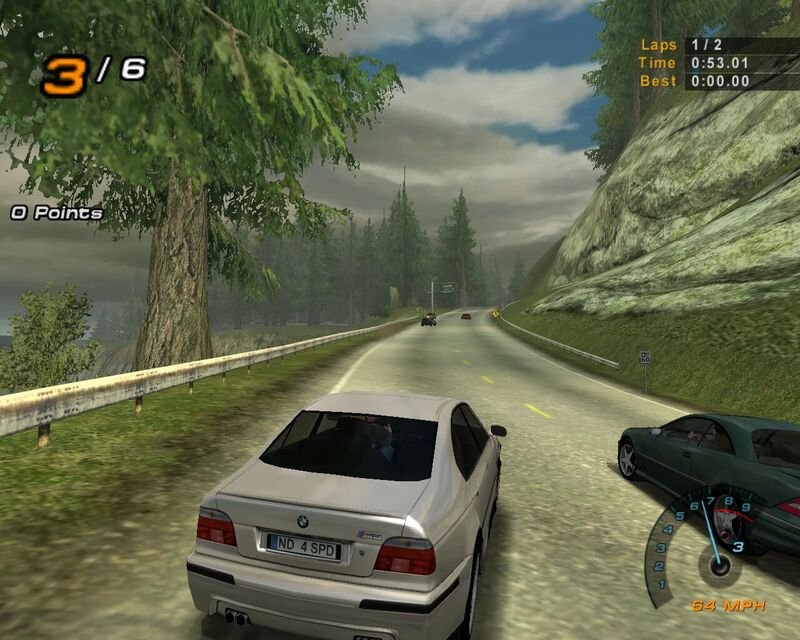 The only things we didn�t like about Multiplayer was the fact that there was no �Be the Cop� mode and no traffic. I thought that Quick Race was nice and convienent. 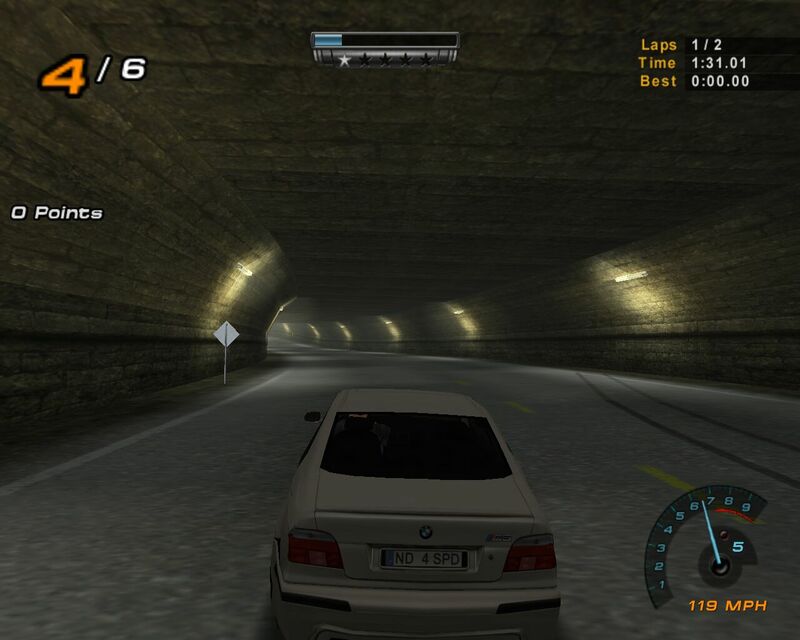 If you want to race, but don�t care what car you�ll use and where you will race, it�s a nice option to choose. It automatically sends you to a race using a random car/track. I didn�t use it much, though, only when getting screenshots. The Single Race mode is pretty much self-explanatory. You choose the track, the car, and the difficulty, and you race. 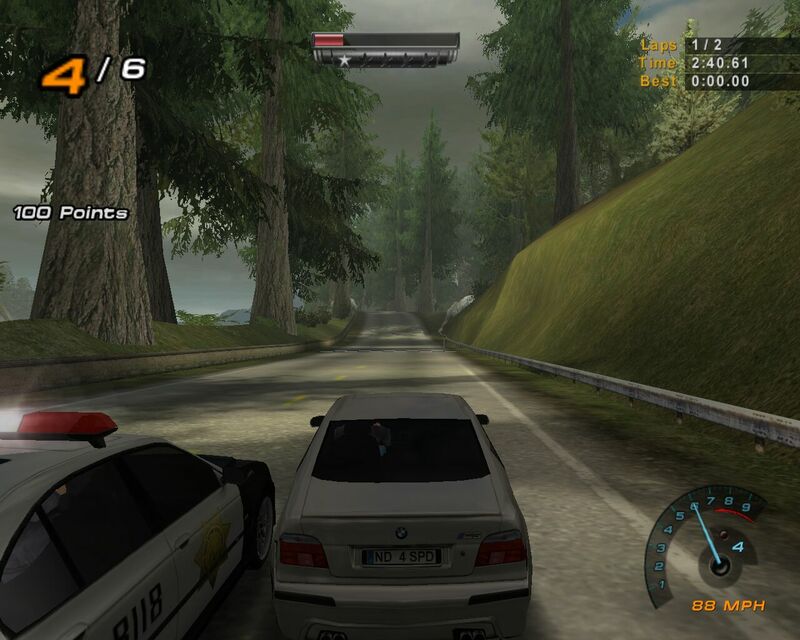 The difficulty level didn�t do much however; it just changed the number of cops in the game. I have to admit that cops are fun, but they can get annoying quickly. There are different techniques that the cop�s use to catch you. The most frequent is the good-old roadblock. In this one the cops block your path in an attempt to catch you, they are fairly easy to bypass. Watch out for the spike trip as its almost impossible to by-pass. If you hit it the police automatically catch you. Although it�s hard to avoid, it is possible. Despite the fact that it is very unrealistic, my personal favorite is the helicopter. A helicopter follows you dropping bombs on its way, If you hit one and your car flips over. 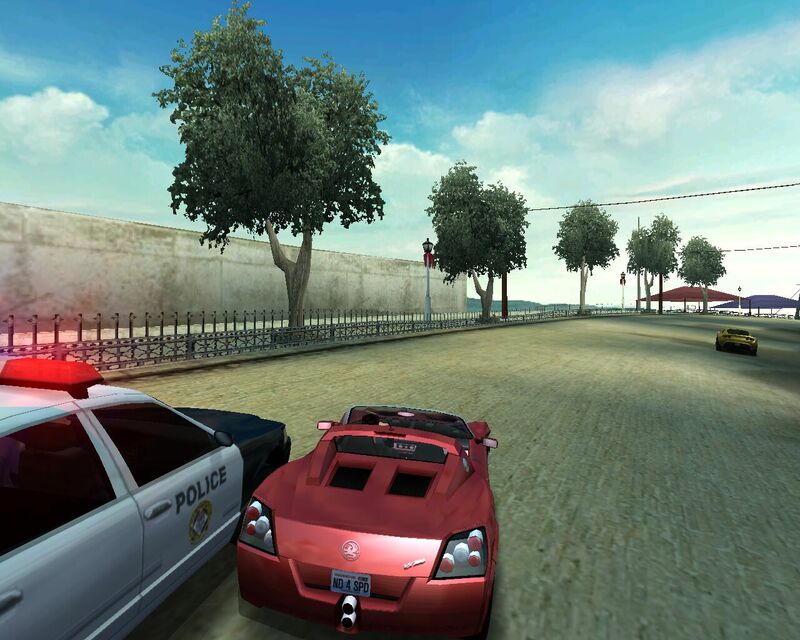 It�s a challenge to escape the cops when the helicopter arrives, but it is possible. 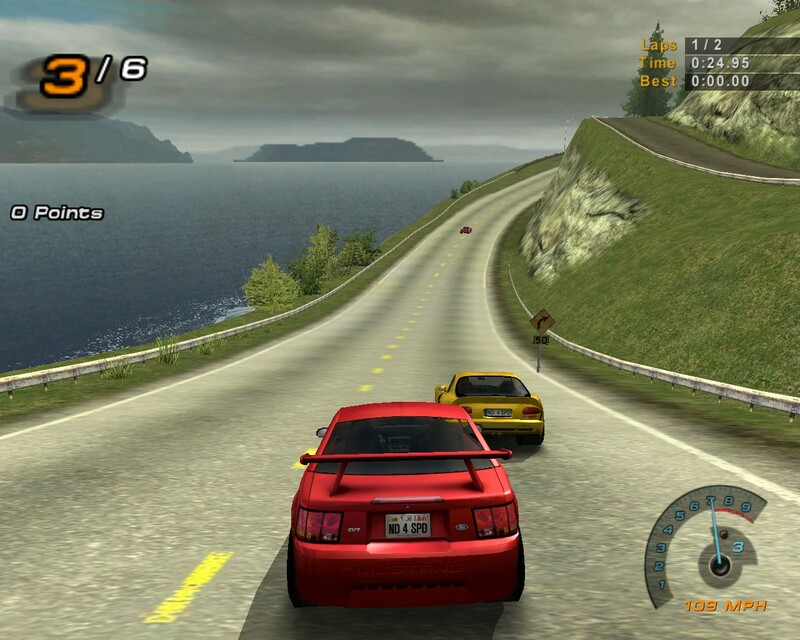 This is essentially the prime reason for getting the game and sets it apart from any other racing game. It�s actually quite fun, but it�s also challenging. 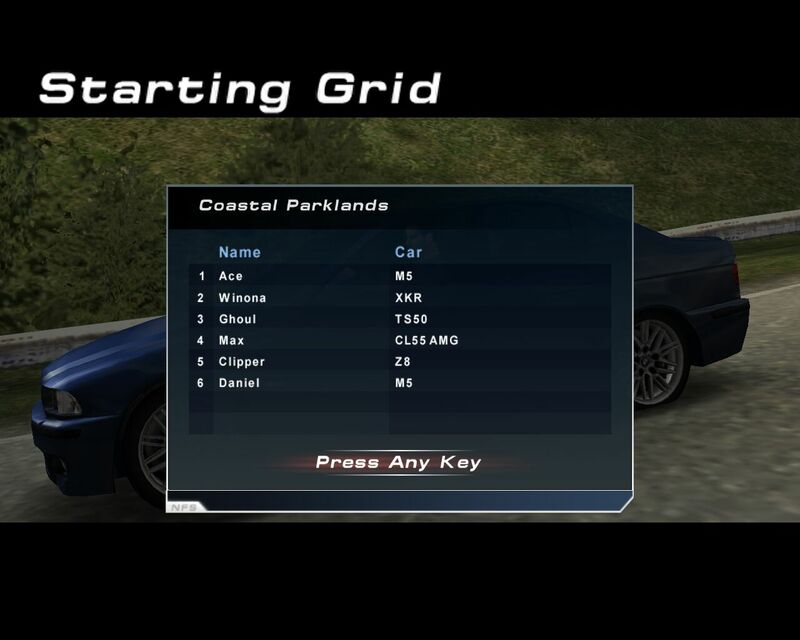 You start out in random location in the track you select. 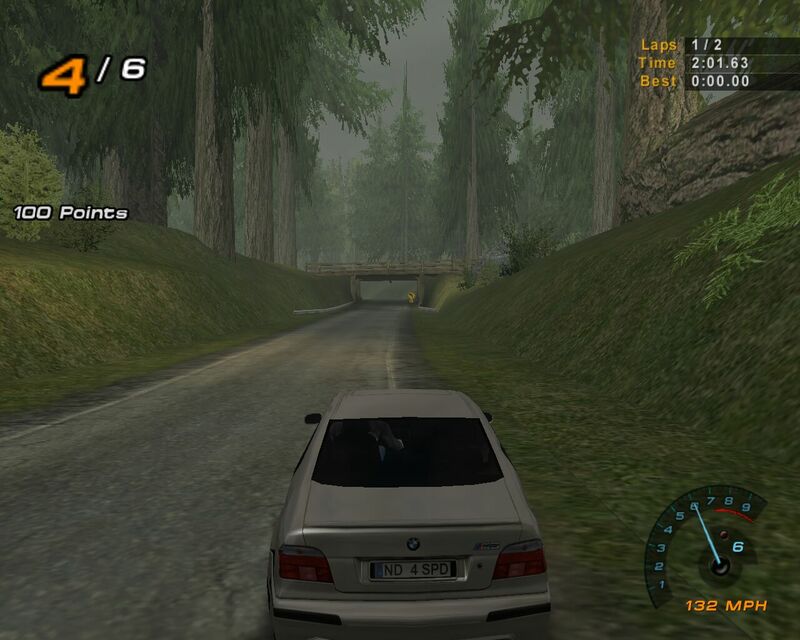 After the 3�2�1� countdown, you begin chasing a car that�s right in front of you. There�s a little �health meter� over every speeding car. Once the health meter is empty, they are busted. Sometimes it�ll take just one hit, but other times it�ll take quite a few. It all depends on how much force you use. If you are having trouble getting a speeder, you can always call for backup. 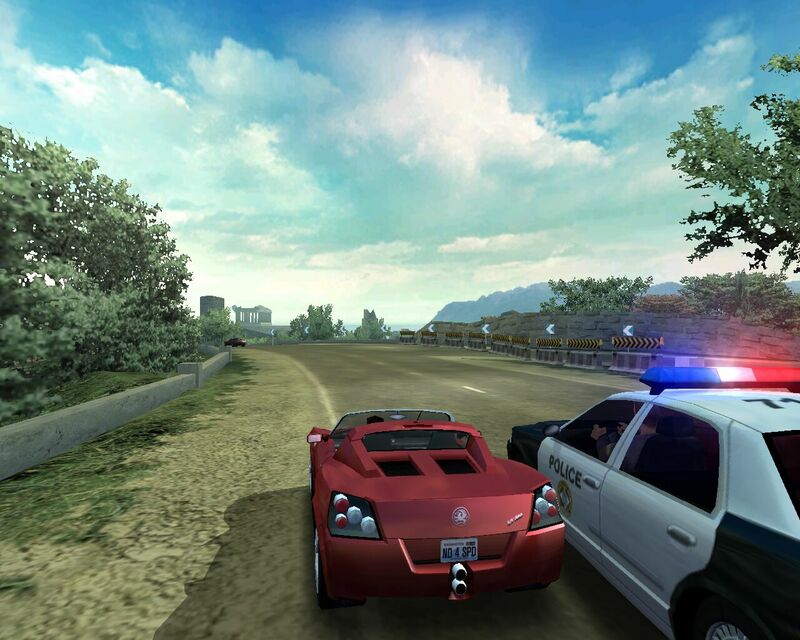 There�s the helicopter, that�ll throw bombs down at the car, a roadblock, or a request for extra squad cars. 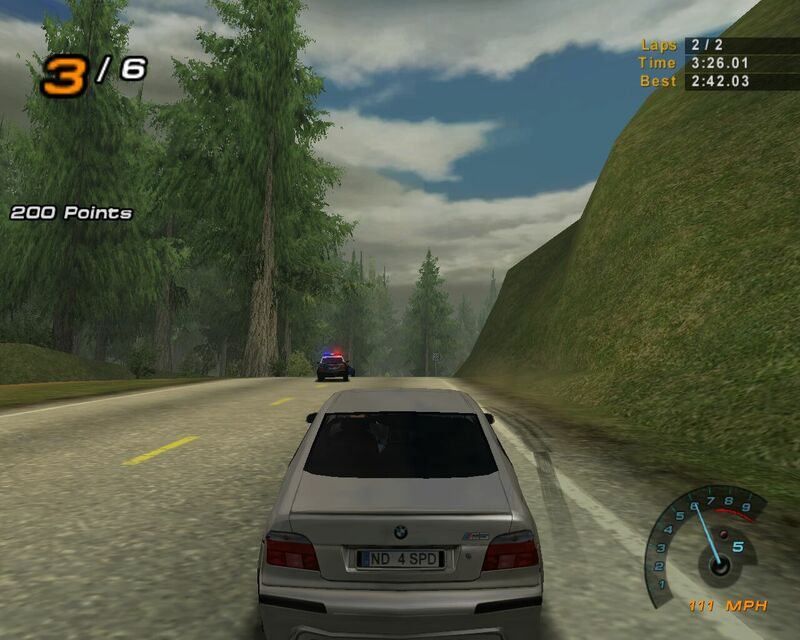 The problem with the squad cars, however, is that if they get the car, points don�t go to you, making it useless. This is the same with the roadblock. Be warned, the helicopter is not perfect, when throwing down bombs, they could hit you and make you spin out of control. 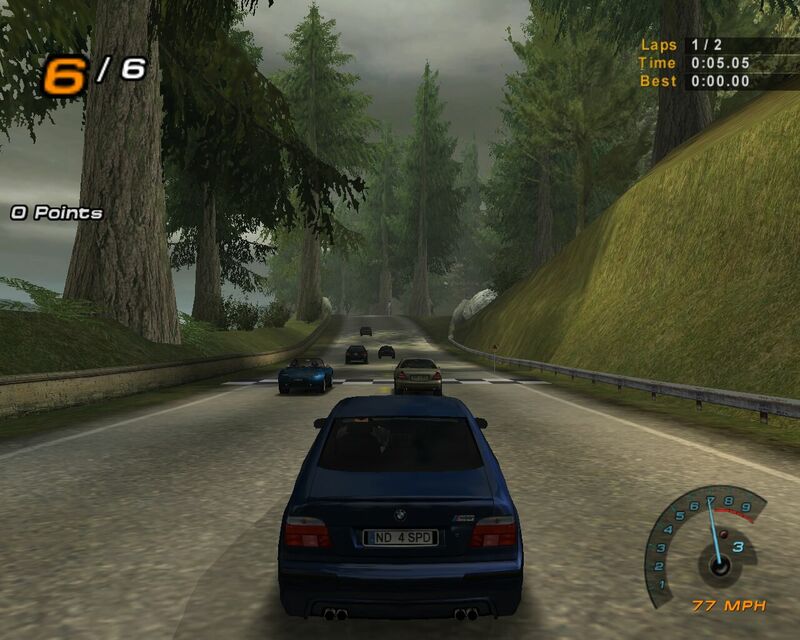 The cars are one of the most important features in this game and any other racing game. 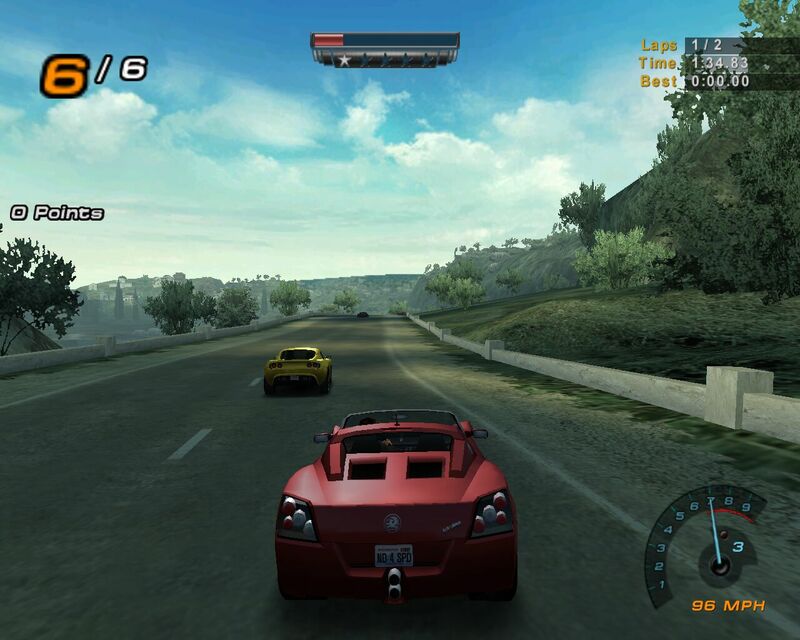 The game has a fairly large selection of cars, but nothing too special. 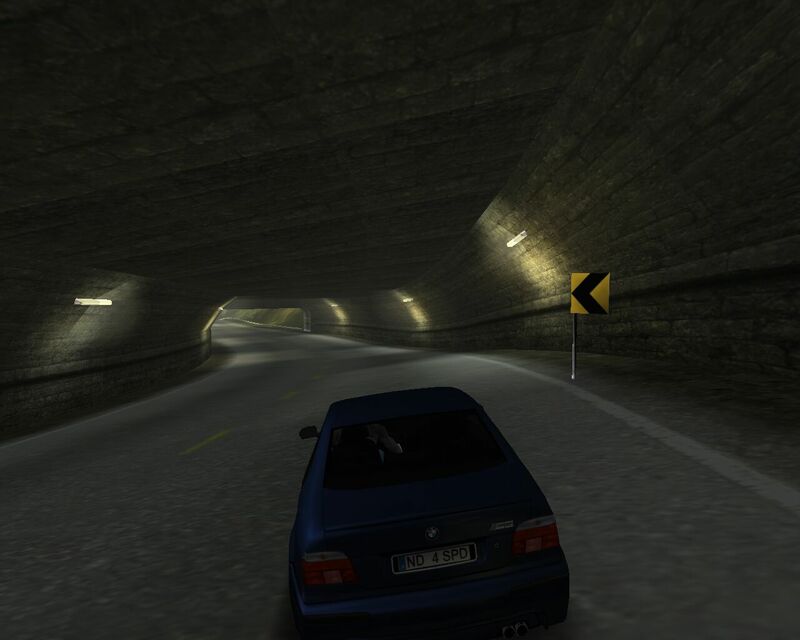 Like most arcade racing games, handling is very unrealistic, but it�s still very fun. It would have been nice for EA Games to put some kind of chart�or something, to show performance of each car. 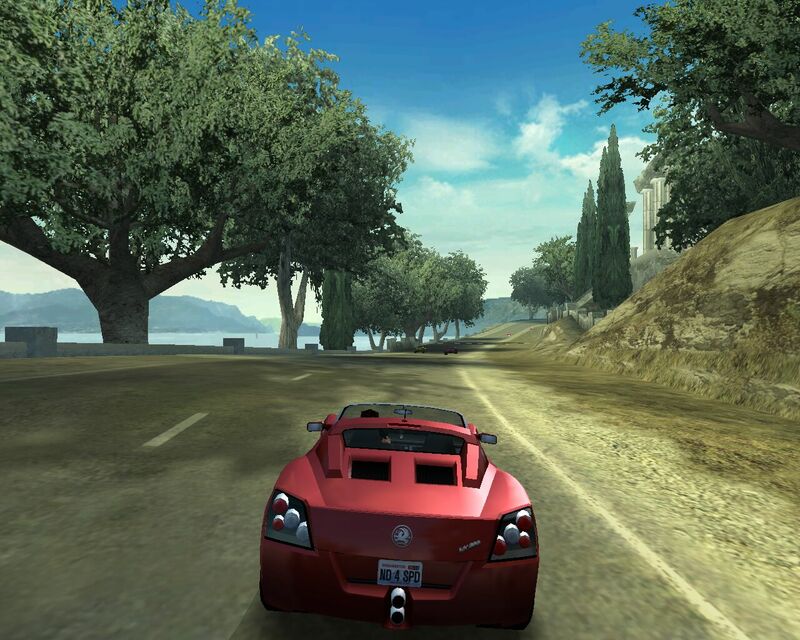 Since EA doesn�t have that, you aren�t really sure of how much power a car actually has unless you try it out. But, nevertheless, the cars in the game are complete and satisfying. 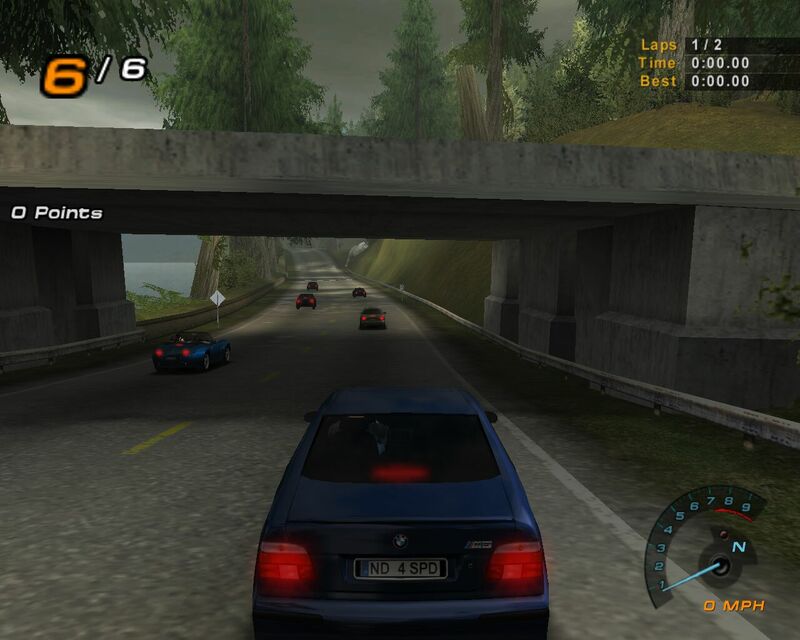 I wasn�t too impressed with the amount of tracks in the game, around 10. They can get very boring after a time, and since this game doesn�t have a story, I got bored very quickly. Despite the fact that there are so few tracks, however, the ones that were included were designed extremely well, with many different shortcuts. Hopefully, EA will release new tracks for download to add to the game. I�ve already seen quite a few fan sites that have tracks for download, my favorite being www.nfs-planet.de. The music in the game drives me crazy. It�s really that simple. 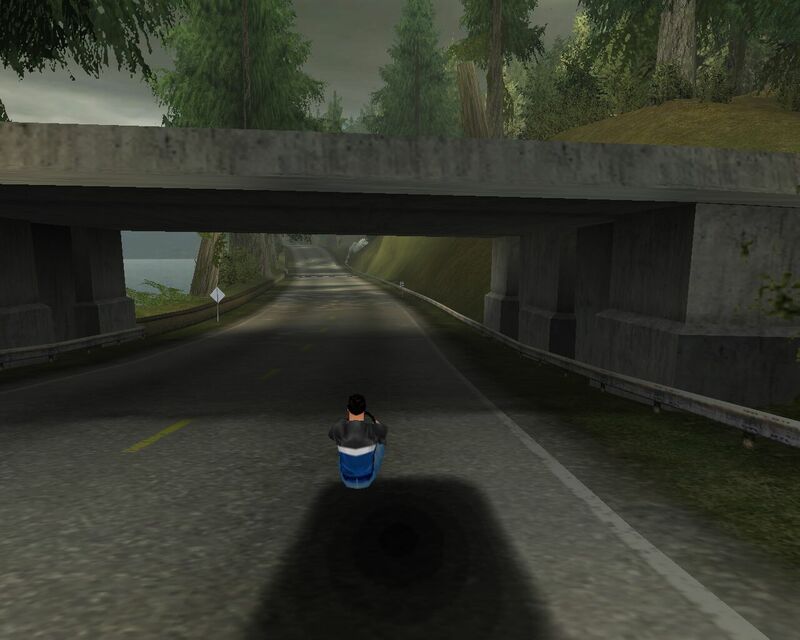 It�s repetitive and uncreative, and the game lacks the support to add your own music. Most games let you select the tracks you want, not with HP2. I left the music off all of the time while playing. It was that annoying. Of course, if you like the music, it�s different, but, in my case, I couldn�t stand it. Everything else in the game sounded excellent. All of the engines on the cars had a different sound, and they all sounded realistic. No other concerns with the sound. I thought that the graphics in HP2 looked pretty good, but occasionally, graphics in previous versions looked better! 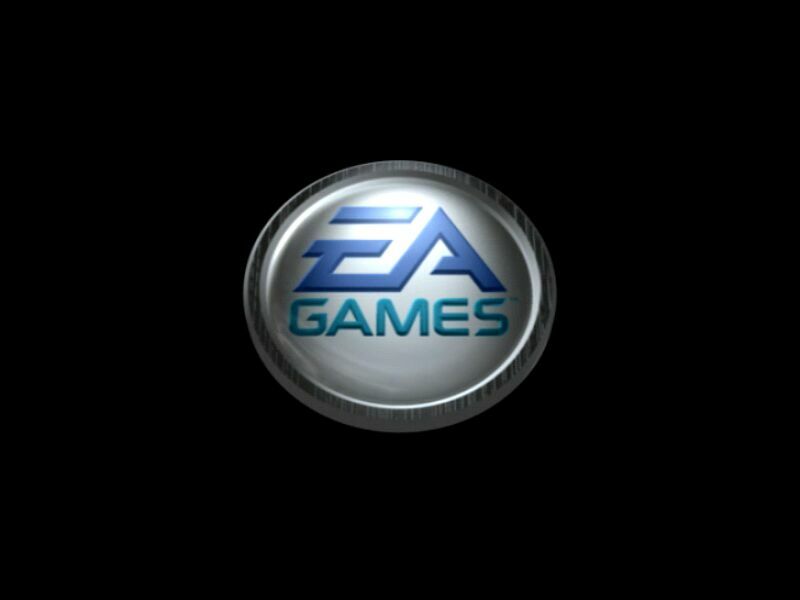 There�s no weather in the game, and that was annoying. The only way to know what kind of weather you have is by looking at the sky. Damage was not too impressive either. Sometimes, the cars would get beaten up, but then some other times, there would be almost nothing done to the car. Of course it wasn�t too bad, but it did get annoying. I ran the game with a Athlon XP 2200+ and a ATI Radeon 9700 Pro, I experienced no problems performance-wise when playing at 1280x1024 with all the settings turned up on high although there was the occasional chug, but nothing too noticeable. To get the game running completely smooth, I had to bring it down to 1024x768. 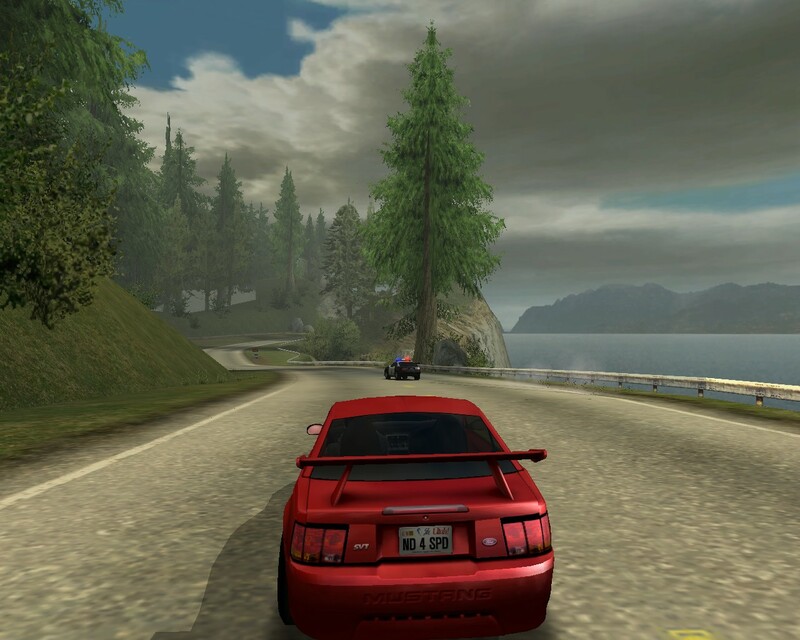 It�s surprising that a game that doesn�t even look too good requires such heavy system requirements. 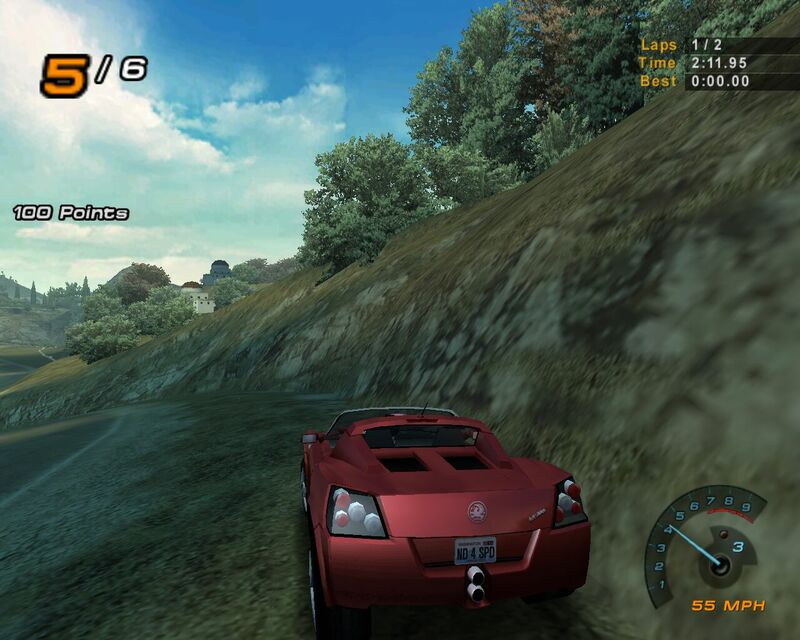 This is simply the coolest thing about this game, and about any racing game I�ve ever seen. It�s fun, simple, and really cool! 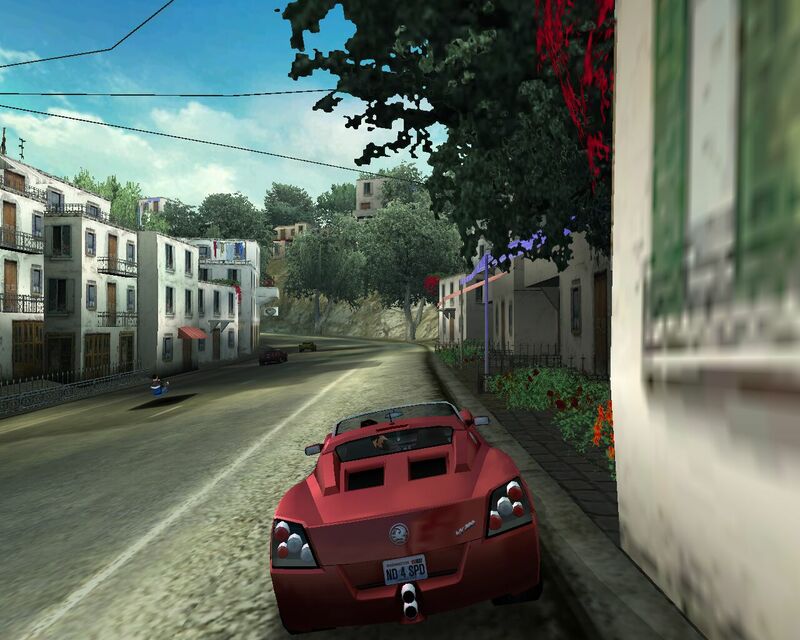 The game features a nice selection of cars, about 40 in all, ranging from a Lotus to a McLaren F1. 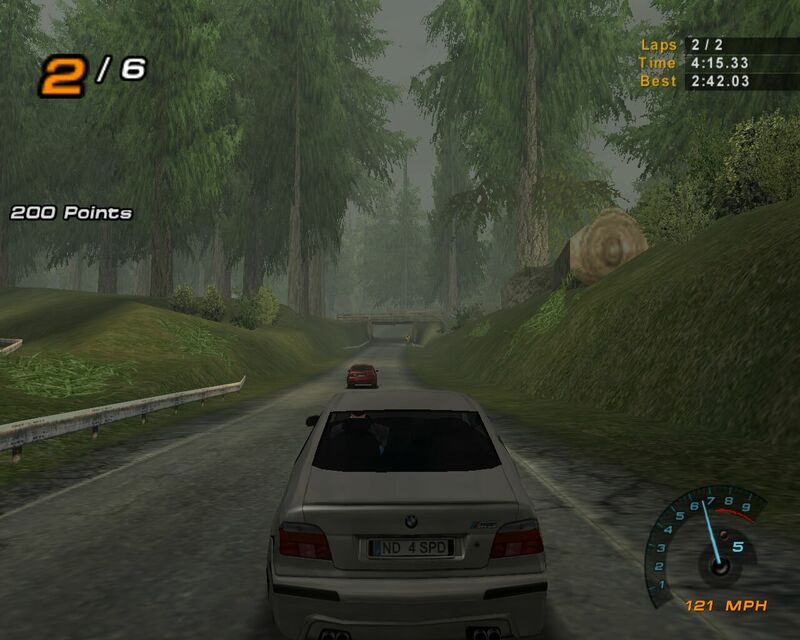 The handling of the cars was unrealistic, but nevertheless, they were fun, which is the point of the game. Sound effects were also impressive. Each car had a different engine sound, and background noises were also nice. They did a great job here. Graphics were nice in this game, and had many details. But, overall, the graphics were nothing too special. 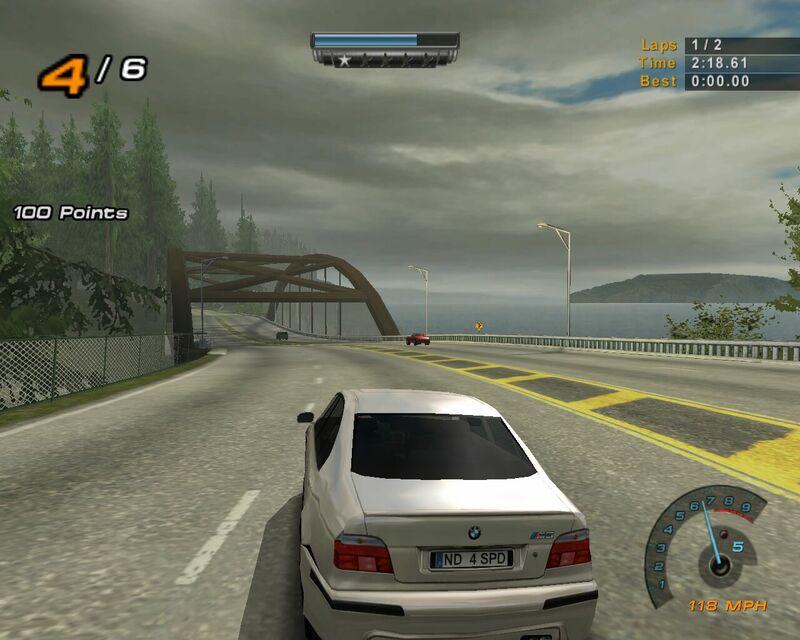 I also didn�t like the fact that there was just about no weather in the game. System requirements for unusually high for a game that had nice graphics, but nothing spectacular. I could run it, with occasional choppiness using an ATI Radeon 9700 Pro at 1280x1024 with all of the settings on high. It�s surprising that not even the most powerful video card at the time can�t even run a game that doesn�t look anything more then good. The music was probably on my top ten list of the worst music in a computer game, but, of course, it�s my opinion. From my point of view, it was horrible and extremely annoying. Therefore, it lowers my overall score of the game. The game has very few tracks to choose from. Although I liked all of them, the fact remains the same. Playing the same tracks over and over again gets very boring. 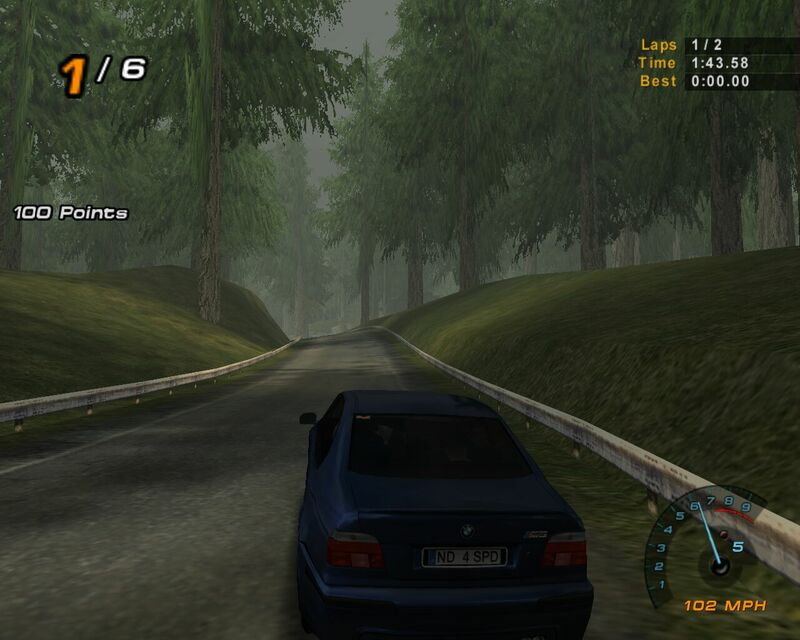 Even when racing on a track that�s backwards or mirrored, it still seems to be the same track, making it remain boring. 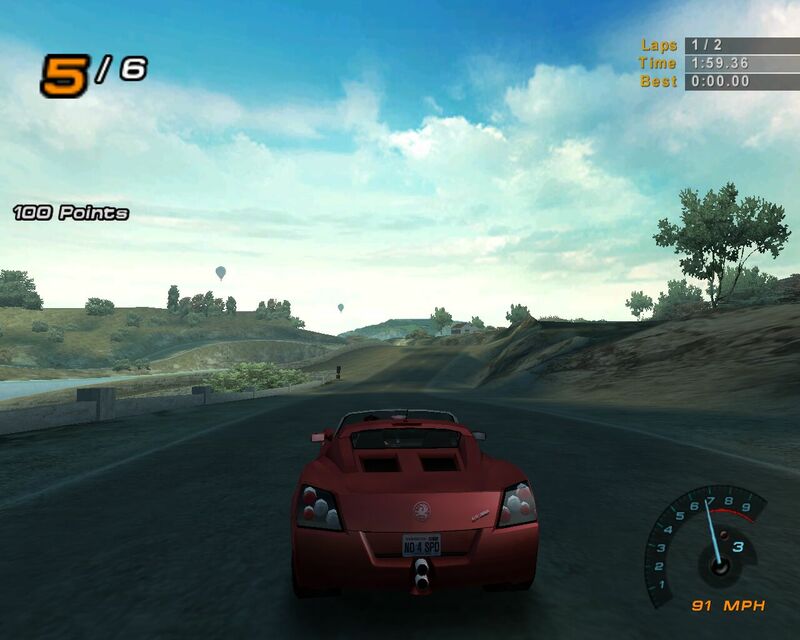 Fortunately, there are many websites that offer downloadable tracks to add-on to your game for no cost. Finally, damage was also unimpressive. If you hit a tree at 200MPH+, chances are your car will be severely damaged, but not in this game. Most of the time, not even a scratch will appear on the car when a situation like this happens. 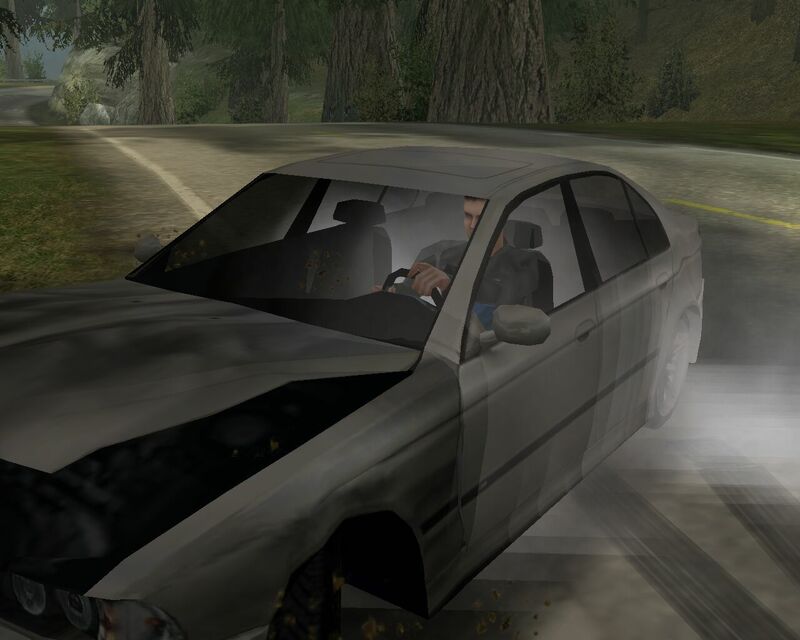 However, when the game realizes a crash takes place, the car does look somewhat realistic.